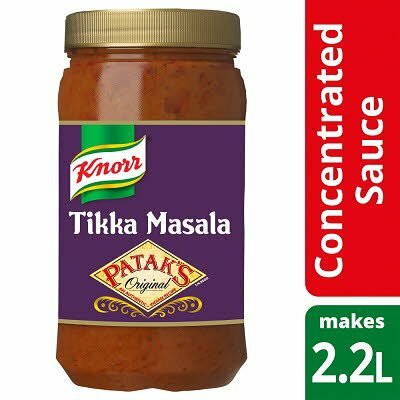 A concentrated tikka masala sauce combining tomatoes, cream and yogurt with a blend of spices. Water, concentrated tomato puree (12%), YOGURT (9%), single CREAM (9%), rapeseed oil, modified maize starch, sugar, spices (contain MUSTARD), ginger puree, garlic puree, dried onion, coriander powder, lemon juice from concentrate, salt, paprika powder, cumin seed, paprika extract, cracked coriander seed, acid (lactic acid), cracked black pepper, dried coriander leaf, natural coriander leaf flavouring, dried crushed red chilli. Made in a factory that uses nuts and peanuts.